I love Hostess Twinkies!! LOVE THEM! 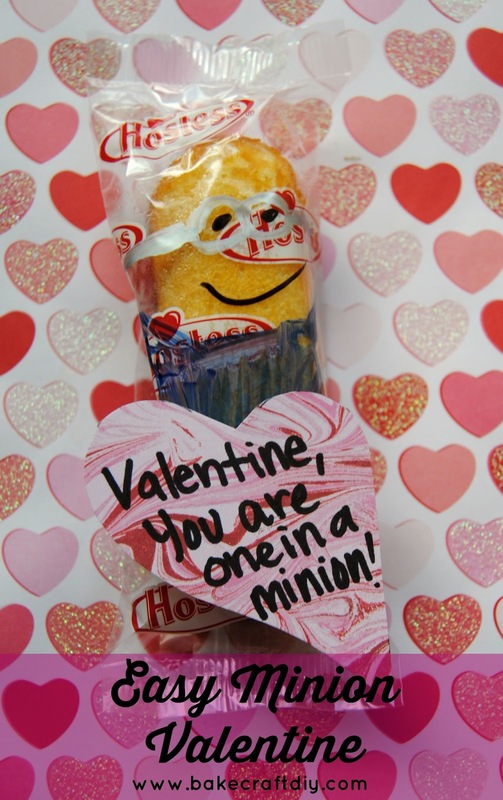 So what better way to show my love than to give a snack that I love! 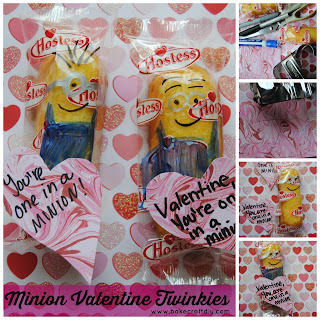 These Minion Twinkies are so easy to make, just draw on your Minion and attach your Valentine. We made homemade Valentine's Day cards but you could just as easily attach store bought valentines to make this valentine even easier! Draw the eyeball or eyeballs with the silver marker (or black). Add the hair, eye and smile with the black marker. Finish off your minion with some blue overalls. We had some extra craft paper that we used, you'll also need scissors, pen, and a heart stencil (we used a cookie cutter. Trace and cut out the heart shape and add you valentine slogan... we love the "You're one in a minion" saying.